Animated comedy following the loveable plasticine pals in which they set up a lucrative window cleaning business. While working they meet wool shop owner Wendolene (Anne Reid) and Wallace becomes infatuated with her. Meanwhile, Gromit becomes interested in the case of some disappearing sheep, believing Wendolene's dog to be responsible. 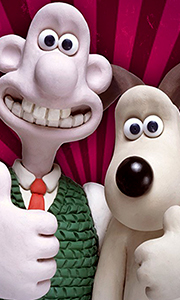 However, the devious dog frames Gromit and Wallace must pull himself together in time to save the rep..
A Grand Day Out: Wallace likes a nice bit of cheese with his crackers, so when this eccentric inventor finds his fridge empty and the local corner shop shut for the Bank Holiday, he is forced to look further a field for his cheddar. The two modelling clay heroes blast off in their home-made rocket on the ultimate day trip - Wallace and Gromit are off to the moon! The Wrong Trousers: This time the modelling clay stars are plunged into..
A Grand Day Out: Wallace likes a nice bit of cheese with his crackers, so when this eccentric inventor finds his fridge empty and the local corner shop shut for the Bank Holiday, he is forced to look further afield for his cheddar. The two modelling clay heroes blast off in their home-made rocket on the ultimate day trip – Wallace and Gromit are off to the moon! The Wrong Trousers: This time the modelling clay stars are plunged into a h..
A Grand Day Out: Suddenly finding himself cheeseless, Wallace goes truly balistic, flying his home-made rocket to the Moon with Gromit in search of his favourite snack. The Wrong Trousers: A mysterious new lodger hijacks Wallace's techno-trousers for use in a dastardly crime caper! A Close Shave (Starring Shaun the Sheep! ): Sheep rustling, love and an evil guard dog ensnare Wallace and Gromit in malevolent mystery only they can unrave..
Wallace likes a bit of cheese with his crackers, so when this eccentric inventor finds his fridge empty and the local corner shop shut for the bank holiday, he is forced to look further a field for his cheddar. the two modelling clay heroes blast off in their home-made rocket on the ultimate day trip - wallace and gromit are off to the moon! Special Features Audio Commentary, The Amazing World Of Wallace & Gromit, Shaun The Sheep Trail.. The plasticine heroes of A Grand Day Out, The Wrong Trousers, A Close Shave and The Curse Of The Were-Rabbit are back in a classic 'who-doughnut' mystery from four time Academy Award winning Director Nick Park. Cheese-loving inventor Wallace and his faithful dog Gromit have started a new bread baking business, 'Top Bun', with 62 West Wallaby Street now a bakery complete with ovens, robotic kneading arms and an old-fashioned windmill on ..
Own Wallace & Gromit - The Curse Of The Were-Rabbit DVD from Deff, DVD, Blu-Ray & 4K Video Specialists - Free UK Delivery.. When their town's prized produce starts disappearing, our cheese-loving inventor and his savvy canine companion must use all their wildly imaginative inventions to try to capture a mysterious beast of epic and fluffy proportions! Special Features Behind-The-Scenes Fun, Including 'How To Build A Bunny', 'Stage Fright': The Award-Winning Aardman Short Film, Deleted Scenes With Cracking Commentary, And Much, Much More!.. This time the modelling clay stars are plunged into a hilarious tale of skulduggery involving an extraordinary pair of automated trousers and a villainous penguin. Posing as an innocent lodger, the fiendish fish-eater sets about recruiting mild mannered Wallace as an unwitting accomplice to his dastardly plot - a diamond heist with a technically advanced, trouser-inspired difference. It is left to Gromit to turn detective and save the d..